In preparation for the summer rains our erosion control work has continued across the property. We have finished our work along the river with most of the small gullies protected by vegetation barriers aimed at slowing the speed of run-off water across the surface, thus preventing excessive top soil loss during rainfall. We have now switched to a heavily eroded area in the north of the property which showed very little growth during last year indicating poor soil conditions. The hope is that by limiting further erosion and creating banks of fertile soil behind vegetation barriers, grass seeds and other plants will be left in the area after rain. These should then be able to germinate in situ as opposed to being washed out into the rivers. The last two months have given us some lovely camera trap photos of previously recorded species including Brown hyena (Hyaena brunnea), spotted hyena (Crocuta crocuta), leopard (Panthera pardus) and the elusive bushpig (Potamochoerus larvatus). We have also captured an image of a Slender mongoose (Galerella sanguine) on the camera traps for the first time. Continued observations at the 4 mammal census sites around the property have shown 14 mammal species in the vicinity of the water points. 9 species were recorded drinking from the water sources at the census sites. The most prolific species was impala (Aepyceros melampus) recorded on 27 separate occasions with a total of 116 animals observed over the 2 months. African elephants (Loxodonta africana) were close behind being observed 16 times during censuses with 131 individuals noted over those 16 sightings. There were also regular sightings of Plains zebra (Equus quagga), Greater kudu (Tragelaphus strepsiceros) and Blue Wildebeest (Connochaetes taurinus) at the water points. We recently started a second project called the mammal road count. This was to try and ascertain what the populations of ungulates are on the property. This data is very important to us as it enables us to calculate whether there is a large enough base prey population to allow the possible reintroduction of predator species back into the area. 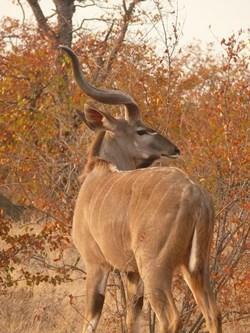 We estimate there to be between 500 and 600 impala utilising the property. Currently the data suggests there to be around 400 but we have only just begun the study and further repetitions of the count need to take place before an accurate calculation can be obtained. We have several different models of bird research running at any given time. The bird census on the reserve carried out along the Limpopo River and at the mammal census sites continues to give us information about the general abundance of certain species and indicates the progress of various local migrations. July and August saw the addition of 3 new species to our list: Red-headed finch (Amadina erythrocephala), Cape bunting (Emberiza capensis) and African stonechat (Saxicola torquatus). This brings the total species count to 244. We are continuing our work at Thune Dam recording the water bird species which occur there and monitoring the colonisation of the dam together with the progress of any breeding attempts by species now using it. We have now recorded 56 species of water bird using the dam ranging from common resident species such as Red-billed teal (Anas erythrorhyncha) to scarce migrants such as the Greater painted snipe (Rostratula benghalensis). The data shows a general increase in the diversity of species present at the dam as well as an increase in the population of most of those species. The censuses in August have shown the arrival of some beautiful migrant species; Little stint (Calidris minuta), Ruff (Philomachus pugnax) and Curlew sandpiper (Calidris ferruginea). The arrivals appear a little premature compared to literature and data from previous years. This could be a reflection of improved conditions in the area or larger scale climatic changes are affecting the migratory patterns of these species. Over the past two months we have been concentrating on mapping the drainage lines and water points, and have succeeded in mapping 18.9km of drainage lines and 6 permanent water points across the property. The next stage of this study is to measure the distance between each of the 91 baobabs on the property and the various drainage lines and permanent water points. From this data we hope to look for a relationship between the amount of damage done to the trees by elephants and the proximity to water. Virtually all the wire from old fencing on the property has now been removed and it is rare that we stumble across more fencing. We have gained permission from neighbouring land owners to remove fencing and rubbish along the public road that runs through the property all the way to the border post at Platjan. So far nearly 13.5km of the road has been scoured by our volunteers and we have removed 10 bags of rubbish ranging from beer bottles to old farm machinery all of which poses immediate risk to the animals which utilise the area. We have also removed fencing from large portions of the road filling the truck on 2 occasions. 8 vegetation censuses were completed during the two months, most of them focused on the northern side of the property. Three new tree species were added to our tree list from these censuses; Mustard bush (Salvadora persica), Rock fig (Ficus abutilifolia or Ficus ficustettensis) and Jacket plum (Pappea capensis). The data for mopane woodland shows that 58% of the woody vegetation is Mopane (Colophospermum mopane) and 19% being Lowveld cluster leaf (Terminalia prunoides), the other 23% of woody vegetation is made up of 17 species or genus groups contributing between 12% and 0.02%. The mopane woodland substrate census also showed little variation with 54% of land cover being bare soil, 19% non-woody vegetation such as grasses and small flowering plants, 16% organic matter and 9% exposed rock. 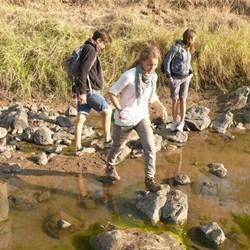 There have been no new transects completed in the riverine areas and so no changes to this effect. Approximately one year ago we started an experiment to see whether or not applying sealant to trees damaged by elephants would increase the chances of the tree recovering. The theory was that by preventing further damage from elephants and infection from termites and disease the trees would recover more quickly. We have started to revisit these trees to see if there has been any success. So far we have revisited 27 out of 60 trees along the river. The majority of these trees have received little or no new damage. However, one large Marula (Sclerocarya birrea) was difficult to find because it had been completely destroyed. Further visits will be required to confirm the success or failure of the method. 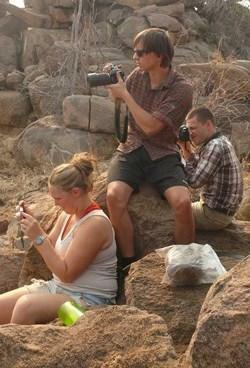 Many Elephant identification sessions took place over the last two months. 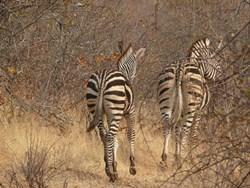 Several hundred photographs of individuals and herds were taken from vehicles and at the hides. The long process of collating this information, selecting usable photographs and compiling an identification key is in progress. As new individuals to the project are still being sighted it is proving to be a difficult task to accurately place individuals in the correct herds. 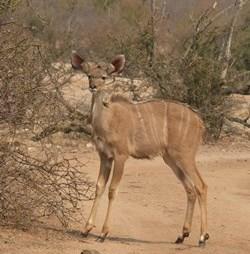 Multiple sightings of all individuals are required before a herd structure and composition can be confirmed. 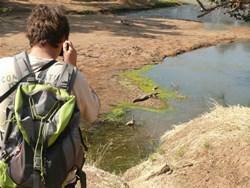 Over the last 2 months we have conducted 5 crocodile censuses and recorded 32 crocodiles on those trips. 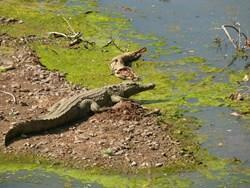 The largest number recorded in any given day was 8 individuals, and crocodiles observed have ranged in size from 0.5m to 4m. Some of the crocodiles observed are almost certainly captive-bred individuals that escaped from a crocodile farm in South Africa during the January floods. Eleven species of predator were recorded as being present at Wild at Tuli during the last two months, these included lion (Panthera leo), Leopard, African wild Cat (Felis silvestrislybica), African civet (Civettictis civetta), Honey badger (Mellivora capensis). Sightings of Black-backed jackal (Canis mesomelas) and Spotted hyena were relatively common, as were leopards. Four individual leopard cubs were identified across the property. Camera traps picked up two separate Brown hyena feeding on the carcass of a crocodile and two injured Spotted hyena. One was missing a foot probably as a result of a snare and despite attempts to supplement its food it has not been seen for several weeks and is presumed dead, the second Spotted hyena was caught on a camera trap with a snare around its neck. The hyena in the snare appeared to be in no discomfort but we will keep a watch for it to monitor its condition. All volunteers who stayed longer than 2 weeks took part in the Bird Identification Course which aims to teach them how to use the bird field guides available at camp so they can use those skills whilst doing the bird censuses. The course also hopes to raise interest and awareness about birds and their importance in the ecosystem and how they can be important tools for conservation. We continue to regularly patrol areas which are high risk targets for poachers. We also monitor the public gravel/ tarmacked roads and the veterinary fence along our boundary with the local community land which is all easily accessible. Fortunately, we have found relatively few fresh snares but we do always find a couple and even after years in the bush the snares can still be a major threat to the safety of the wildlife. Two sessions of the elephant diet study were conducted in the last two months, 18 dung piles were sampled and 1 identifiable seed was collected, Apple Leaf (Philenopteraviolacea). The method of the study has also been changed slightly as the previous method was very slow. We also intend to change the way in which the hard and soft fibre is estimated by using scales to weigh the mass of the two types rather than estimating based on size. With the move to Motswiri Camp completed nearly 4 months ago there are still the occasional finishing touches required. In the last 2 months we have completed the footbridge which will eventually lead to a small hide overlooking the recently completed artificial waterhole next to camp. Other work has included the construction of wood racks to store firewood and the planting of several indigenous evergreen trees around the camp to provide shade and privacy during summer and winter. 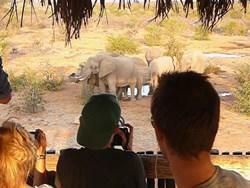 Most of the known baobabs on the property that had been severely damaged by elephants have now been repaired. In the last two months only two new damaged baobabs have been discovered. They have been successfully repaired with mopane struts placed in the holes and securely wrapped with wire in an effort to provide support to the tree and prevent further damage from elephants. A new large project that is to be undertaken at Wild at Tuli is the construction of a large dam to provide water for the animals throughout the year. The dam will be big enough to hold water even in drought years thus preventing the large scale starvation that was seen over the winter of 2012. The proposed dam will be approximately 5 hectares in size and will be located on the northern side of the property. In order to test to see if the ground is suitable for a dam the volunteers dug eight 1.5m deep pits to allow soil experts to see if the ground would hold water in the area we want to build the dam. Preliminary results from the sample sites would indicate that the soil is of good clay quality and should hold the water. Now we wait for construction to begin! Throughout the summer and autumn we were concentrating on removing a highly invasive alien plant species called Smelter’s bush (Flaveria bidentis). This species has now dried up due to the winter cold so we have switched our alien plant removal efforts to a more obvious species, Sweet prickly pear (Optunia ficus-indica). This species spreads quickly in good conditions and with few local predators can colonise huge areas if left unchecked. We have removed two individuals from along the banks of the Limpopo before they had time to flower or fruit this year. Most volunteers took part in the Tree Identification Course which aims to teach them how to use the tree field guides available at camp so they can use those skills whilst doing the vegetation censuses. The course also hopes to raise interest and awareness about trees and their importance in the ecosystem and how they can be important tools for conservation. 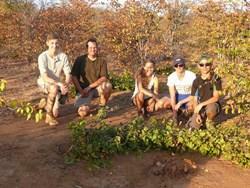 All the volunteers over the last two months have had the opportunity to spend the day at a wilderness reserve situated about 50km from Wild at Tuli where they have a resident population of 12 White rhinoceros (Ceratotherium simum). The volunteers were able to track the rhino on foot and on all occasions found them with relative ease and were able to approach to within 20m. Part of the experience is aimed at raising awareness of the fact that rhinos throughout Southern Africa are in a very precarious position. Horn poaching is a sad reality and ever increasing threat to the point where these trips may be the last time any of these volunteers will ever see a rhino in the wild. Over the last few months we have had very few reports of the resident Wild dog pack (Lycaon pictus) which was last seen in February numbering just 6 individuals compared to the 11 which were seen in September last year. We spent two mornings at another reserve about 30km from Wild at Tuli where we think they resided last year in an attempt to locate them using radio telemetry. Despite covering the entire reserve of approximately 10000 hectares we were unable to locate any signal on the telemetry kit. We subsequently received news that a pack of Wild Dogs has been spotted on a farm in South Africa near Platjan Border Post. This farm is not predator-friendly and is cause for concern. We suspect that this is the pack that we have been seeing as one is reported to have a collar on. We have made contact with the South African authorities and offered our services to try and track these dogs down and establish if it is the pack that we know. Our concern is for their safety as there are some ridiculous reports circulating that 5 cows were killed in 2 days and attributed to the dogs! In recent months there have been nuemorus reports of lions roaring in the Central Tuli Block and there have been a number of sightings as well. We are delighted with the prospect of them settling here especially as one of our staff saw a little cub crossing the main road a few weeks ago. A number of volunteers have seen spoor of lion and they have heard them walking past Motswiri Camp. In the Central Tuli Block there are still a couple of cattle and goat farmers and this will inevitably bring about conflict if the lions target them so we have initiated a project which aims to educate the farmers on better animal husbandry, assist them with building more secure enclosures for their animals, and, in the case of a confirmed kill by lions, we are prepared to discuss some form of compensation in exchange for the assurance that the lions will not be eliminated. The first incident was reported in the first week of September and we have been called repeatedly to the cattle post where the lions are. We managed to capture a picture of one of the lions on our camera traps at the cattle post and have now entered into discussions with the owners on how we can help. 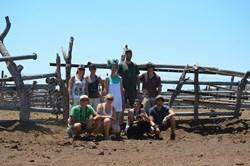 The first visit involved all the volunteers surrounding the main ‘kraal’ with thorn bushes which act as a good deterrent to predators. Two staff members have slept there overnight twice but the lions did not arrive on those particular nights.